Bearded dragons belong to the Old World family of lizards, Agamidae, and are members of the genus Pogona. They earned their common name due to their tendency to inflate their throats when angry or excited, giving them a bearded appearance. Docile and relatively easy to care for, baby bearded dragons are one of the most popular pets acquired by herpers. However, feeding them must be done with professional guidance, precision and care, as overfeeding can result in illness, injury and even death. Compared to the digestive systems of warm-blooded mammals, the systems of cold-blooded beardies are remarkably simple, so they require time to digest their food properly. Time and care in feeding is especially important with delicate baby beardies. Like babies of all species, baby beardies grow rapidly and require a lot of food. Allowed to eat unchecked, they may eat and eat until they are stuffed, and attempt to consume foods too large or fibrous for their tiny systems. It's vital that you feed them age-appropriate meals in frequent, balanced portions. Overfeeding your baby bearded dragon can cause painful constipation, or worse, the formation of a food bolus, or mass, in his stomach. As a result of the bolus, pressure is placed on the spinal nerves, causing paralysis in the hind quarters. If not treated immediately, this condition is usually fatal. Foods that are too tough to process can also cause problems in your beardie's fragile digestive tract. For example, adult crickets contain tough, fibrous parts -- like serrated legs -- that can cause serious internal injuries. Signs that your baby bearded dragon has been overfed or is suffering from internal injury include lethargy, lack of appetite, bloated appearance, dragging or hindered movement in the hind legs, and the inability to control movement in the rear portion of his body. If you notice any of these symptoms, contact your veterinarian immediately. Keep your baby beardie healthy by offering small, controlled portions several times per day. Diet staples should include insects and vegetables, especially greens. 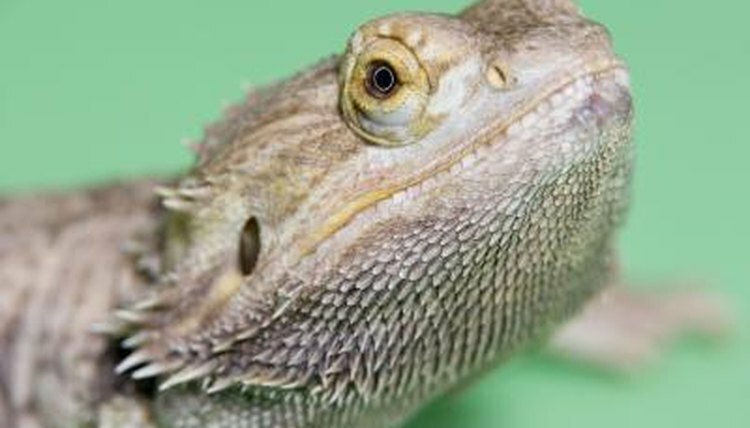 Two to three times per day, feed your beardie as many insects as he can consume in 10 to 15 minutes, then remove all uneaten insects from the enclosure. Place a shallow dish of fresh, finely chopped vegetables in your beardie's enclosure every day. The herper's rule of thumb is to never feed your baby beardie anything wider than the distance between his eyes. Babies should be fed tiny insects such as newborn, or pinhead, crickets, and mini mealworms (Tenebrio obscurus). Babies' vegetables should consist mainly of greens with a few other veggies. Always chop them finely and remove any hard veins or tough pieces. Appropriate greens and vegetables include collard greens, endive, turnip greens, mustard greens, chard, escarole, dandelion greens, chicory, and cooked acorn, butternut, spaghetti and yellow squash. Some foods should never be offered to your baby bearded dragon. Never feed large insects, such as adult crickets, roaches or standard mealworms (Tenebrio molitor). Fireflies or any insects that glow are lethal to beardies, and don't ever feed insects you catch yourself, as they can be contaminated with pesticides and parasites. Avocados are toxic. Avoid any greens with the word "lettuce" in them, especially iceberg lettuce, as they can cause diarrhea and dehydration. Lastly, don't feed spinach -- it's too hard to digest.